As one of the leaders in Real Estate sales for the mid-Peninsula, Maria Scott strives to provide her clients with exceptional service that is unsurpassed. Maria’s success in real estate is driven primarily by her genuine enthusiasm for the field. Whether it is marketing, sales negotiations, loans or escrows, Maria is well informed in all areas associated with the transaction of your home. Maria’s skill sets are derived from her lengthy experiences in High Net Worth Private Banking, and Sales Environments. Maria believes that honesty, loyalty, and accountability are what make the difference in her relationship with clients. Whether you are a buyer who wants a private tour of homes suited to your individual desires or a seller who needs creative marketing techniques to sell your home, Maria can help. Maria showcases her listings on her website at www.mariascotthomes.com, and utilizes the services of a professional photographer, virtual tour providers, and graphic designers to assist in marketing his client’s properties. 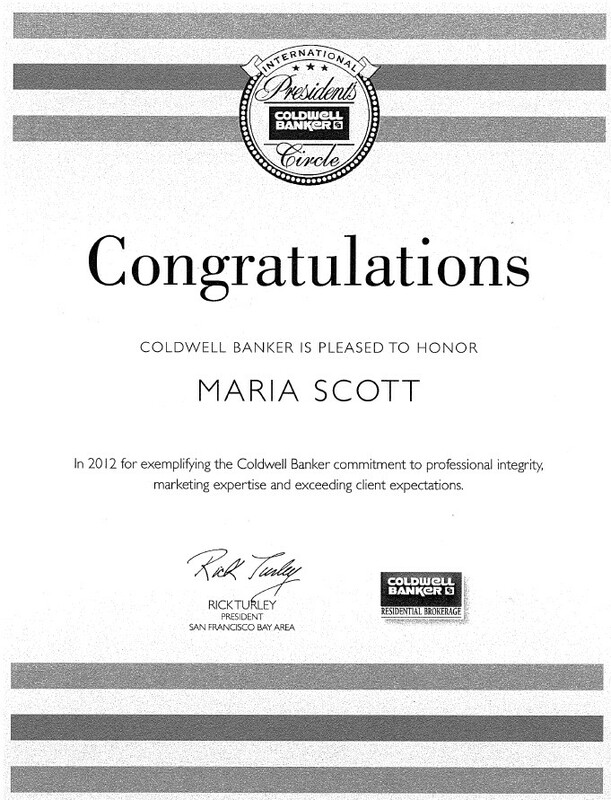 Maria’s diverse background and impeccable reputation in the real estate community has made her a true asset to Coldwell Banker and the community.